Julie's stitching and other bits….. So, the time has finally come to pack up my bags and return to Algeria 😦 The time has passed far too quickly (as usual) and I’m dreading going back to be honest. Specially as we have no internet over there at the moment!!! So we go back on Saturday morning inshallah, kids are back to school on Sunday, and I’ll be on my own for the first time in 3 months. Have to get back into all the housework and cooking that I’ve been able to share with my mum over the last 3 months. And back to the heat – it’s still up in the 30s over there so the air con will be going full-time. We just about managed to get all our stuff into 4 suitcases, and 3 hand luggage bags – not sure if they’ll all fit in the car at the other end though!!! Anyway, before packing my sewing away – it’s been so strange not having anything to do the last couple of days – I did take a quick photo of my progress on my daughter’s prayer rug. She is really pleased with it, so that’s good enough for me. 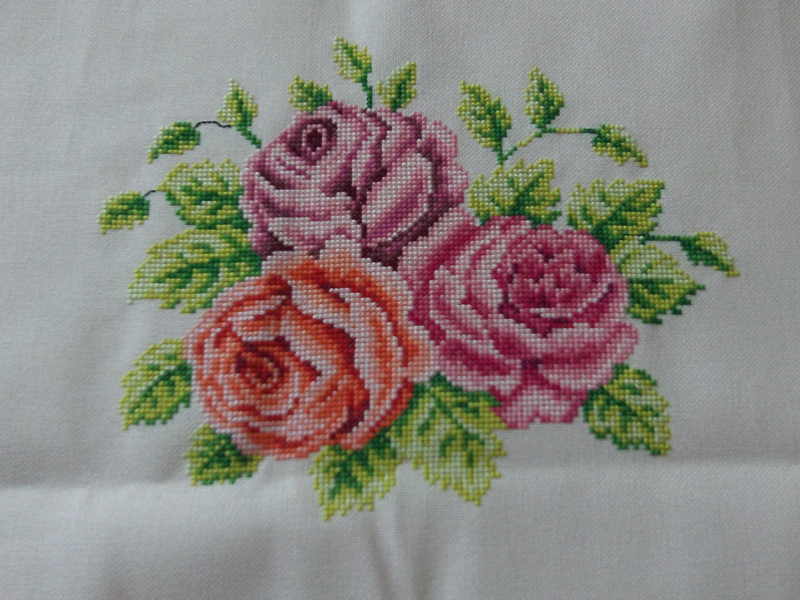 I managed to complete the main centre piece of flowers, which is what I was aiming for. So, until I don’t know when – knowing Algerie Telecom could be weeks and weeks – keep safe and well and catch you all later. Absolutely gorgeous work! And I hope the move back goes better than you expect! Julie, your stitching is just lovely. I hope your move goes well. Stitching is lovely Julie. Hope you have a safe journey and that you manage to settle back in Algeria without too much effort. Just look forward to your next visit to the UK. Hope to hear from you soon. I am a mother, a wife, a human being... I am not a cimbing frame. Style, food, travel and interiors with the editor of SISTERS Magazine. My life in Algeria, simple daily stuff.